On May 29, 1969 Sliema Wanderers were playing against Hibernians in the FA Trophy semi-final when the news circulated around the terraces of the stadium that Joe ‘Jockey’ Xuereb had died tragically in a car accident. 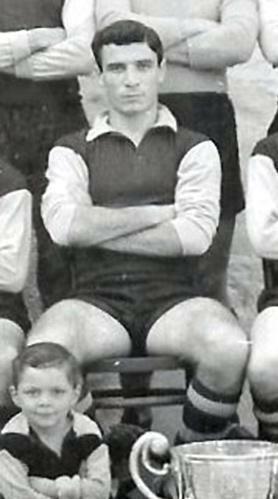 Xuereb was one of the most popular Sliema players in the fifties and early sixties. He was born in Paola on August 22, 1934 but soon after his birth his family moved to Sliema. It was, therefore, in the backstreets of the town and the Sliema primary school that he learned his football. By the time he reached his 10th birthday, Xuereb already had the build and stature of a mature adolescent. He could hold his own against boys much bigger than him and soon he was playing competitive football for Sliema Hotspurs in the Anglo Maltese Football League. The Hotspurs’ players, including Xuereb, were members of the Sliema Boy Scout Group. In 1947-48, with Xuereb leading their attack, the Hotspurs won section honours and finished runners-up in the final standings. Sliema Wanderers were quick to spot his talent and in 1949, at the age of 15, he was signed for the Blues’ minors team. Xuereb was made captain of the team and under his leadership, Sliema won section honours in 1950-51 and reached the knock-out final. Not before long Xuereb was playing in Sliema’s third and second division teams where he became a great favourite at the Schreiber Sports Ground. On February 7, 1953, he made his first-team debut for the Wanderers in the league game against Valletta. The Blues lost 2-0 that day but he kept his place in the team for the rest of the season. That was the start of a long and distinguished career for Xuereb and by the time he hung up his boots in 1964, he had played 78 top-level matches and scored 46 goals. During this golden period he won three championships, three times the FA Trophy, one Cassar Cup and two Scicluna Cup medals. Xuereb was an all-round sportsman. Apart from his insatiable appetite for football, he was also a fine hockey player and played at centre-forward for the Malta Eastern Club. He also liked to play waterpolo and in the fifties figured in a few matches for Sliema ASC. At school Xuereb also distinguished himself in track and field and his favourite events were the long jump and the 220 yards hurdles race. Xuereb was not everybody’s idea of a classic player. He was surely no dribbler but he knew how to use his physique. packed a powerful shot in his boots and was also a very good header of the ball. But he was known most of all for his bravery and never-say-die spirit. Perhaps, the distinctive mark of this great-hearted player was the way he went for loose balls, bravely risking life and limb in the hustle and bustle of the penalty area.